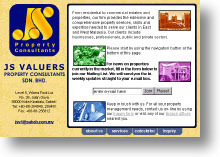 Webdesign by Lorna - Portfolio - JS Valuers Property Consultants Sdn. Bhd. JS Valuers Property Consultants S. B.